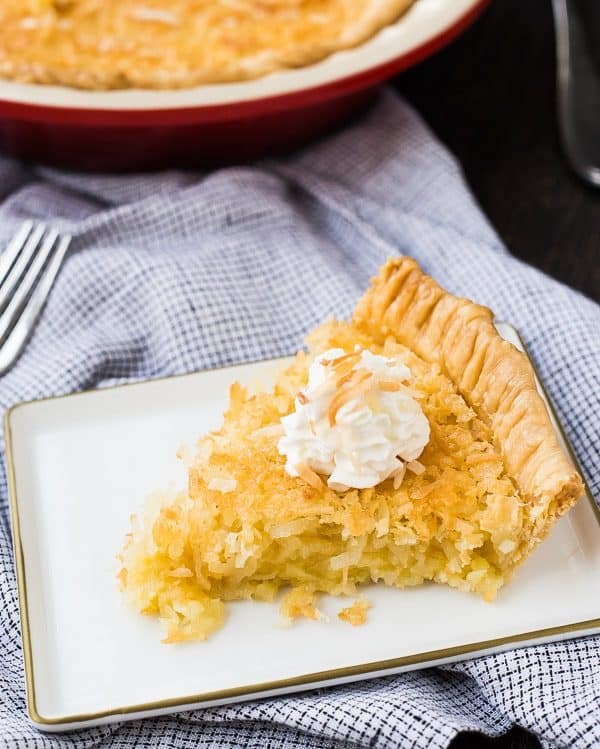 The easiest Coconut Custard Pie recipe — if I can do it so can you! No prebaking the crust required! 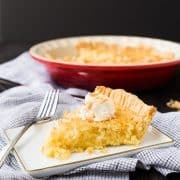 This pie recipe will immediately become a favorite! I don’t create many original pie recipes here, because they’re a nightmare to photograph and also because I’d eat the whole dang thing in one sitting if I’m not careful. I’m not good at making gorgeous pie crusts like Kirsten is (she’s an artist!). I pressed a fork around the crust of this one and called it good. When I do make a pie, it’s probably a cookie pie or an ice cream pie like this sprinkle ice cream pie recipe or this unbelievable Irish coffee ice cream pie. I’m cool with tarts, tarts I can do. I’m a lover of all things savory at heart, so this Vidalia onion tart is one of my favorite things (the bacon and feta don’t hurt!). This yogurt tart? It’s beyond perfect for summer and you’ll still be able to wear your bikini. YOU will, not me. Truth be told, it’s that top crust that really scares me (and also what makes pies extra difficult to make look pretty in a photograph). 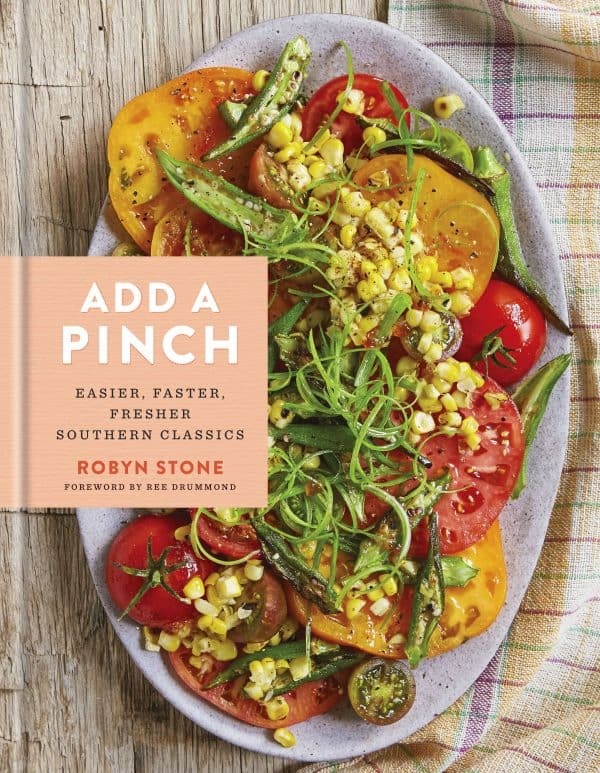 When Robyn of Add a Pinch asked me if I’d be interested in a review copy of her book the answer was an immediate yes – first because she’s a friend, and second because I’ve always been a fan of her gorgeous site and delicious recipes. I knew her book, Add a Pinch, would be just as beautiful (and I was right…I love being right). 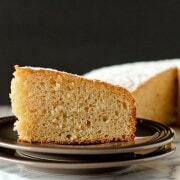 It’s full of classic southern recipes made easier and fresher. 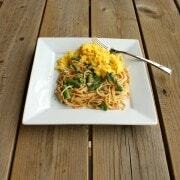 It just so happens that we love EASY and FRESH here at Rachel Cooks! The book arrived at my door with the sweetest, sweetest note from Robyn (it brought tears to my eyes! ), an amazing wooden spoon and a huge cast iron pan. Obviously I have some cooking to do! Then there was this coconut custard pie that clearly caught my eye. It has a short ingredient list and only one crust (phew!). You don’t have to prebake the crust and you don’t have to temper eggs or anything like that. This pie is obviously a good fit for pie-fearful me (and you?). 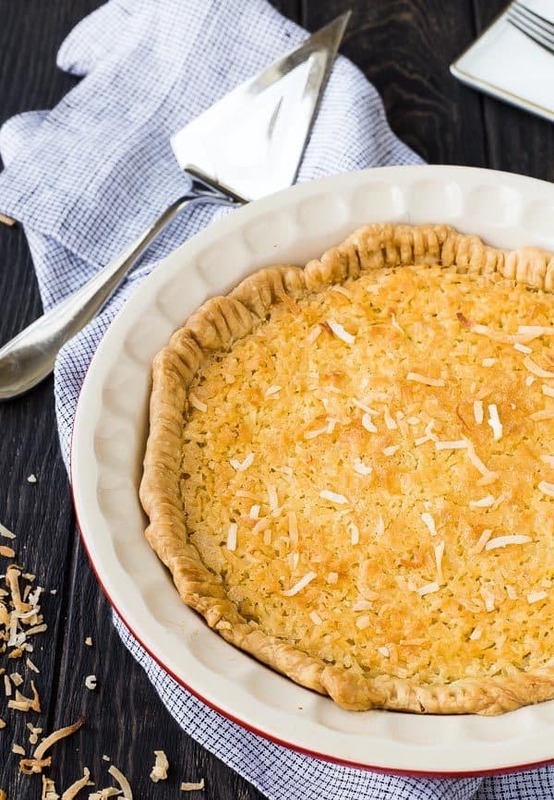 Want a couple more summer perfect pies like this Coconut Custard Pie? 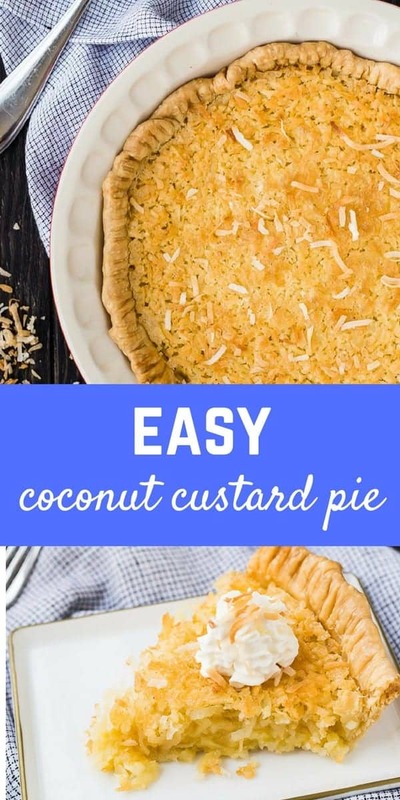 In a large bowl, combine the sugar, coconut, buttermilk, eggs, butter, and vanilla. Pour into the piecrust. Bake until the top is golden brown and the center is set, about 45 minutes. Let cool completely before serving. Freezer Friendly! Let the baked pie cool completely. Wrap tightly with aluminum foil or plastic wrap, making sure to wrap all the way around the top and bottom of the pie. Store in a freezer bag in the freezer for up to 3 months. Thaw overnight in the refrigerator, cut, and serve! 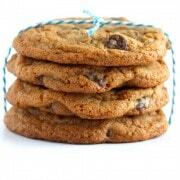 Recipe used with permission from Add a Pinch by Robyn Stone, published by Clarkson Potter. Verdict: I LOVED this pie – I could have devoured the entire thing. Husband’s take: We all enjoyed this on Easter and I didn’t hear a single complaint! Difficulty: If I can do it, so can you. Disclaimer: Robyn was kind enough to send me a review copy of her book but I was not obligated to share it with you guys. All opinions are my own – it’s a gorgeous book! isn’t it so easy and delicious?! 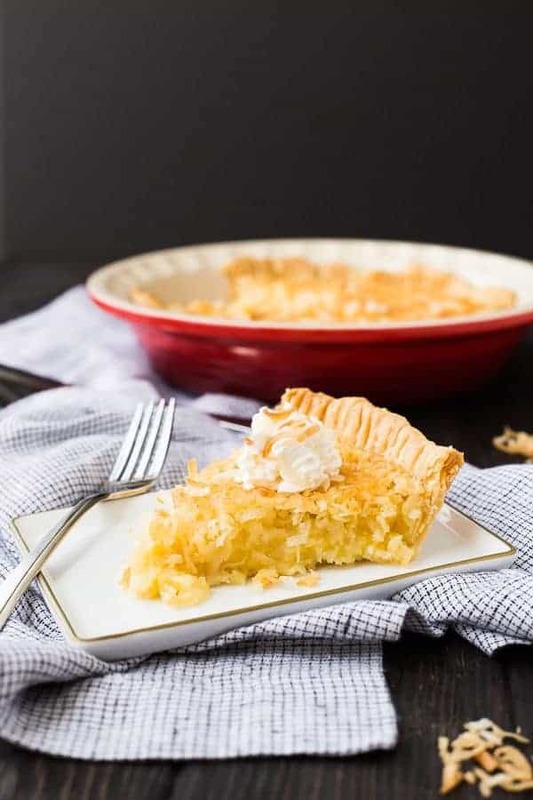 It means so much to me for you to share this recipe – I sure hope your readers love the pie and that you enjoy the rest of the recipes in the cookbook as much as my family does! Thank you so very much for everything! I could just hug you my friend!